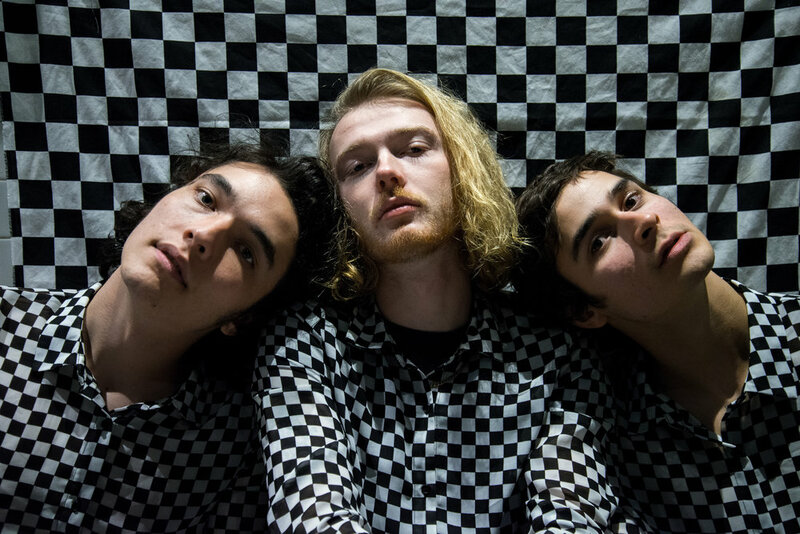 Naked Giants released their debut album SLUFF on March 30th, 2018. The 12-song set was produced by Steve Fisk (Nirvana, Unwound, Soundgarden) and is the Seattle trio’s follow up to their 2016 R.I.P. EP, whose songs Stereogum described as “...hulking behemoths that channel classic rock bravado into something blistering and immediate.” SLUFF swirls with hyperactive restlessness as 1960s harmonies share space with 1970s riffs while at the same time battling an undercurrent of punk rock and modern indie influences. Alternative Press shared the full album stream ahead of its release, stating “Naked Giants might just be your new favorite band (we promise! ).” Rolling Stone named the band one of “30 Best Artists We Saw at The Austin Throwdown” for their 2018 SXSW Review, stating, “The Seattle trio’s set was punctuated by their exuberant chants and peals of feedback. Guitarist Grant Mullen and bassist Gianni Aiello locked into a ramshackle battle, trading licks and bitten-off vocals as they thrashed about the stage in a sweaty tangle of long hair that was worthy of the chest-thumping rock stars they channeled.” Steadily building up their reputation as a tremendous live act, Naked Giants have become members of Car Seat Headrest’s live band and will also support Car Seat Headrest with their own sets on their upcoming worldwide tour. Before joining up with Car Seat Headrest, the band celebrated the release of SLUFF with an album release party in Seattle at Chop Suey. (Please see all tour dates below, with more to be added). SLUFF is available digitally, as well as compact disc, pink colored vinyl and can be purchased now via New West Records. “Like deep and meaningful conversations in the middle of a raucous house party, the tunes Naked Giants serve up here shift the mood without spoiling any of the fun." - Kerrang! Seattle Times – "Naked Giants hit the road with SXSW buzz, raucous new record ‘SLUFF’"
The Stranger – "Naked Giants on Their Debut Album, SLUFF"
Old Rookie – "Naked Giants Released Their SLUFF Debut and Tore Up Hometown Seattle Show"
Rolling Stone – "SXSW 2018: 30 Best Artists We Saw at the Austin Throwdown"
The Current – "Video: Naked Giants bring fun, catchy rock to their SXSW performance"
Austin 360 – "Naked Giants’ fully clothed fun jump kicks its way into SXSW’s rock-hungry heart"
Austin American-Statesman – "SXSW 2018: So many great moments!" Minneapolis Star-Tribune – "Favorite Acts from Austin's SXSW"
American Songwriter – "SXSW, An Unnerving But Still Rewarding Experience"
Do512 – "Our Best Photos from SXSW 2018"
These images and documents are to be used solely for the publicity of New West Records and its artists. Unauthorized posting, publishing, transmitting, reproduction, distribution or any other use or exploitation of the information contained herein is prohibited.